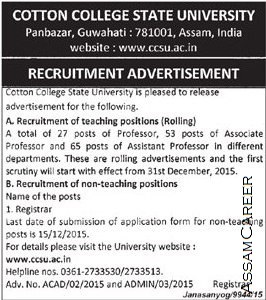 Cotton College State University invites application in the prescribed forms for the following teaching and Non-teaching posts. Educational Qualification: (a) Good academic record with at least 55 % of marks at the Master's degree level in a relevant subject from an Indian university Candidates are expected to have at least 50% marks at the Graduate level. Pay: Pay Band (PB-3) of Rs 15600-39100, AGP Rs 9000, and admissible allowances as per State Government rules. (b) NET/SLET/SET.NET Qualified or Ph.D. Degree. Pay: Pay Band (PB-3) of Rs 15600-39100, AGP Rs 6000, and admissible allowances as per State Government rules. Educational Qualification: (a) Good academic record with a PhD degree in the concerned/allied/ relevant discipline. (b) A Master's degree with at least 55 % of marks (or an equivalent grade in a point scale wherever a grading system is followed). (c) A minimum of (08) eight years of experience of teaching and/or research experience. Pay : Pay Band (PB-4) of Rs 37400-67000, AGP Rs 9000, and admissible allowances as per State Government rules. Educational Qualification: A post-graduate degree from a recognized University with at least 55 per cent marks or its equivalent in the CGPA scale; along with (i) at least 15 years of experience as Assistant Professor in the AGP of Rs. 7000/- and above, or with 8 years of service in the AGP of Rs. 8000/- and above including as Associate Professor, along with experience in educational administration; or (ii) Comparable experience in research establishment and/or other institutions of higher education; or (iii) 15 years of administrative experience, of which 8 years shall be as Deputy Registrar or an equivalent post. How to apply: Pl check the following image for more details or visit ccsu.ac.in .